Fashion tech start-ups were given a unique opportunity to pitch their innovations to investors and huge brands, including ASOS and Charlotte Tilbury, at a stylish event organised by SETsquared in conjunction with the London College of Fashion. The event was hosted by W Soho Hotel on 8 November. 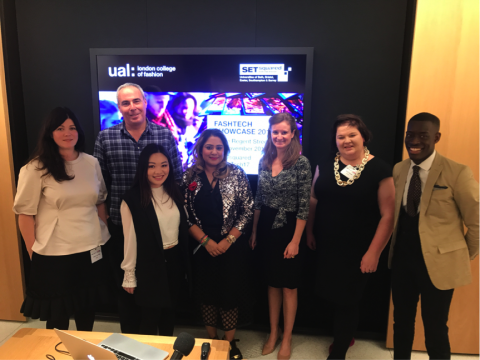 SETsquared, the global number one university business incubator, launched its fashion tech initiative earlier this year with the London College of Fashion to help budding entrepreneurs develop their business ideas and scale up to the next level. Each innovator had a five-minute platform to pitch for investment and business support as well as make connections with key players in the worlds of fashion, business and technology. The pitches were live-streamed inside the W Hotel’s private cinema to a hand-picked audience of investors and buyers, and were also broadcast online to give investors worldwide an opportunity to see the innovations on show. BECOCO – is building a virtual fashion styling platform to help retailers offer true personalisation to their consumers. Infi-tex – has created smart textile pressure sensors, which enable electronic interaction and data collection via soft buttons that can be integrated into clothing. Jeremy Mutebi – has developed a platform that allows men to shop outfits based on the latest trends, and create collections based on collaborations with style bloggers and brands. Metapixel – is creating the world’s largest library of 3D scans of people, objects and environments to sell on our ecommerce store, we aim to be the ‘Getty Images’ of the 3D world. SKMMP – is a fashion supply chain platform for ready to wear Designers. The physical and online digital showroom significantly reduces cost and risk associated with B2B wholesale allowing designers and buyers to do business remotely. Stealthy – is the first smart well-being jewellery brand which actively facilitates a happier and healthier life. Using innovative design the jewellery brings mindfulness to wearers helping them avoid depression and other associated illnesses caused by hypovitaminosis/vitamin D deficiency. Following the pitches, the entrepreneurs got the opportunity to showcase their products at a tech demo party at the glamourous W London in Soho. As well as pitching for support, the fashtech showcase was a great opportunity for the entrepreneurs to share the stories behind their innovations. “In 2015, I forfeited a scholarship and place at a leading fashion school as a result of a hiking accident in Cambodia. I later learned I was severely vitamin D deficient having spent most of my professional life in corporate environments. Following my accident, I worked in the fashion tech industry and also gained experience in healthcare private equity.